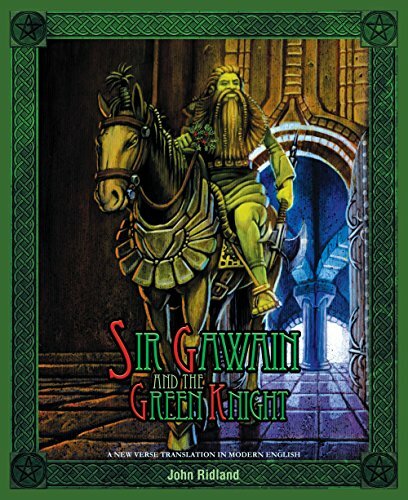 I've just finished reading the new John Ridland translation of Sir Gawain And The Green Knight, and it's a triumph. An often difficult yet charming and morally serious poem, it is written in a Middle English midlands dialect that is even more inaccessible for the modern speaker than is Chaucer's dialect. Not only that, the squat scribal hand is very difficult to make out: I imagine that frequent breaks must be required, even for experienced philological eyes! But back to John Ridland's translation: what's good about it? In the first place, Ridland sees himself in this project as a translator -- and by definition he is thereby tasked with rendering accurately the poem that the late-14th-century (1370s? 1380s?) poet wrought. Just because we do not know the poet's name, it is not on that account a vehicle for the poetry version of a 'starchitect' (yes, Mr Armitage: I'm looking at you). In the second place, he strikes exactly the right balance in diction (word choice) such that the poem seems neither stilted and artificially quaint nor off-puttingly adolescent and aggressively unacademic. It is a mistake to suppose that readers cannot be taken into an enchantment that is not of their own time -- and an even worse mistake to suppose that readers don't even want that. The promise of history and of literature from the past is precisely that it shows us what is timeless and what is also, often gloriously, profoundly rooted in a time and place, simultaneously. The time-bound and the timeless: that is what the sensitive reader of any poem can be expected to want. And John Ridland, most evidently, understands that.